Easy smooth transaction with seller. Would purchase from again. Item came as advertised. I would recommend this item and Seller. Exactly as shown and just what I needed. Shi[ped quickly! On time and as advertised. Good transaction. I do a lot of night photography, and landscapes, this is a great advantage when doing long exposure or landscape shots to keep that sharpness in your photos. I prefer this to the wireless remotes where you have to be sure and hit the eye for the remote to trigger the shutter. It has a fairly long cord, and you can also lock it open when using the B mode for those really long exposures. The price is so much better than the old MC-DC1 which ran $70 plus. Great value for a very functional piece of equipment. A great tool to prevent camera shake @ slower shutter speeds and gain extremely sharp images,because I don't have to directly touch the camera. Plug it into the designated port, it uses your camera battery to power it. It works just like the camera shutter release. 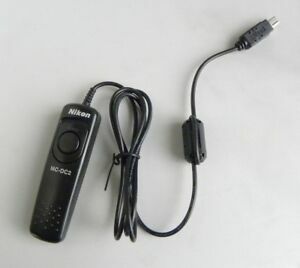 Get this instead of saving a few dollars for other 3rd party shutter release cord. I have heard terrible story about 3rd party cords that were too tight and they damaged the connector on the camera or the cord failed after a few uses. I have used this many times and this cord has worked wonderfully every time. Get it, and you wont regret it. It appears to be decent quality, and it works great. I like that it does not require batteries. Simple to use, very handy for catching the waves at just the right moment with tripod.